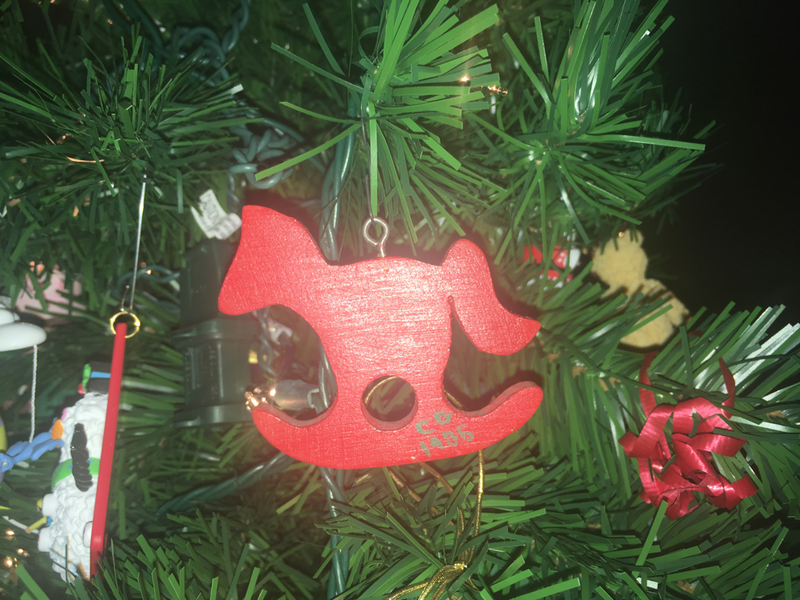 Today’s ornament: The Red Wooden Horse. If I lay all of my ornaments from childhood side by side from year to year, they tell a story. A story of where I’ve been and from where I come; a story of God’s faithfulness through it all. I remember Mom telling us once we were older that this year (1986) we all had painted wood ornaments because it was a year of little. This ornament reminds me that God cared for and watched over us even in the lean years, when there were real struggles to put food on the table, when we had very little. It reminds me that, as Paul said in Philippians 4:12, I know what it is to be in need and what it is to have plenty, and I have learned to be content, whether living in plenty or in want. My parents taught me to trust God when times were tough, to rely on Him when it looked like there was no way—He would make one. Hanging this ornament on my tree each year reminds me that God is faithful. I am not an incredibly nostalgic person, but decorating the Christmas tree definitely brings out the feels! 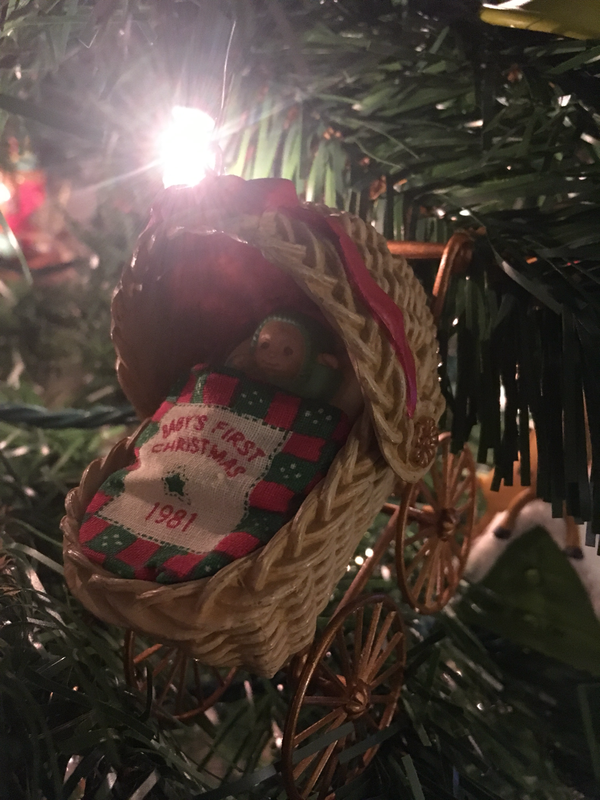 Growing up we received an ornament each Christmas that symbolized something from the year—something we liked, something we did, etc... David and I have continued that with our kids as well. Unwrapping each ornament reminds me of something or speaks to me in some way. Today’s ornament: My first Christmas. Every year when I unwrap it at least one of the kids makes a comment about it being old and broken or about needing to throw it away. And I explain to them what this tradition is and what the ornaments mean. As I said before, sometimes the ornaments remind me and sometimes they speak to me, as this one does. It says, yes, Mom is old (in the eyes of kiddos), maybe a little broken and worn, but Mom is also beautiful, still rich in love, still meaningful and having a purpose. I’m reminded that God takes my brokenness, my imperfections, and He wraps them in His grace, still choosing to use me to be a light for Him in this world. He isn’t afraid or turned away by my broken wheels; as a matter of fact, He delights to show His strength in the midst of my weakness. Thirteen years. In some ways those years have gone by quickly, but they also have a way of blending into what feels like forever (in a good way). Thirteen years ago, in the mountains of Breckenridge, Colorado, I walked down a flight of stairs, out onto a balcony overlooking a beautiful scene. It was a lovely sunny day of 65 degrees, and the snow-capped mountains in the background made for a breathtaking backdrop to our wedding. Our wedding. We had been engaged for nearly a year and a half and together for five and a half years, and we chose to have a very small destination wedding. David's mom, my parents, my sister and her husband, my brother and his girlfriend, and a very special friend of us all gathered on that balcony for the short ceremony. I recall that as I repeated my vows my voice cracked. My sister later told me that she thought I was going to say I couldn't go through with it. My brother-in-law started the ceremony. My brother sang "The Prayer." My dad officiated the service. We toasted and danced in the dining area. Following a horse and carriage ride, we had dinner together at a restaurant down the mountain. Over the years many people have asked if I regret having a small wedding, but I wouldn't have changed it for anything. Truth be told, I wasn't too keen on planning the event at all. Once I picked my dress, I wasn't concerned about any other details. I was much more interested in my marriage than in the perfect wedding. Still, it turned out pretty perfect. Our marriage began as many do, two young kids, so in love and learning everything along the way. We both had an idea of what it would be like, but we learned over those first two years that we needed to allow God to guide our plans for our marriage. Y'all, marriage is hard. It's not hard because one of us is awful. It's hard because it challenges every part of who we are. It challenges our patience, our ability to love, our selflessness, our pride, our intentions, our comfortability. I recall a time in our marriage when I just thought, it is what it is. I was frustrated because I had ideas of what David should be like, what he should say, how he should say it, what he should do. It took a long time for me to finally realize that our marriage is what loses when I focus on what I think David should be like. I began to allow God to show me that above making me happy, He had destined my marriage to make me holy. Precisely because marriage challenges us so much, it can be one of the greatest vehicles in reconciling us to Christ. 1. I must fight for my husband, He will fail, and so will I. Our marriage has positioned me to pull him up and spur him on toward Jesus. Ecclesiastes 4:9, 12 "Two are better than one, because they have a good reward for their toil. For if they fall, one will lift up his fellow....And though a man might prevail against one who is alone, two will withstand him—a threefold cord is not quickly broken." 2. I must allow God to dictate what my marriage and family should look like. I cannot allow my desires and plans to be influenced by the world. Romans 12:2 "Do not be conformed to this world, but be transformed by the renewal of your mind, that by testing you may discern what is the will of God, what is good and acceptable and perfect." 3. I must allow my marriage to mirror Christ's relationship with the Church. Marriage is used over and over in the Bible as a metaphor for a relationship with Jesus. I measure my marriage this way regularly. Ephesians 5:25 "Husbands, love your wives, as Christ loved the church and gave himself up for her." 4. I must pray. For my husband and with my husband. Not long ago, I asked my husband how he thinks he shows his love for me. He said that he prays for me. I was stopped in my tracks. This is huge. This is love. Philippians 4:6 "Do not be anxious about anything, but in everything by prayer and supplication with thanksgiving let your requests be made known to God." 5. I must love. I must love sacrificially. I must love completely. I must love while asking nothing in return. I Peter 4:8 "Above all, keep loving one another earnestly, since love covers a multitude of sins." I love my husband, and I love my marriage. Not because either are perfect but because both push me toward perfection. Babe, I chose you thirteen years ago, and I keep on choosing you today. You have filled my life with joy and love. Happy anniversary! Here's to many, many more! I have been blessed to spend time with some of the people I get to "do life" with as well as some new-found friends over the past week. I love how Christmas gives us more reason than ever to get together and MAKE TIME for each other. Whether it's a surprise 30th birthday party (that I thought was a Christmas party and didn't bring a gift...oops) or a birthday party for Jesus, I am thankful for the friends I'm surrounded with and how God places just the right people in my life at the right time. Over the the past three years I have been lonely a lot. It has hurt. It has made me emotional. Sometimes I've responded to God the right way, and sometimes I haven't. But over the past few months, through making myself LISTEN to God and to voices He has put in my path, I have identified ways God was growing me in my loneliness. As I evaluated this past week, I'm more thankful than ever for my friend Paula, who is probably more like me than she wishes she was...ha...but who definitely gets how I feel at times...so, so blessed to be where I am but also so tired and, admittedly, frustrated with it at times, too. I'm glad God put Paula in my life because she gets me, and she challenges me. I love you, friend! I'm thankful for Rebekah, a woman in my very small group who I've just recently gotten to know but who has such a gentle and meek spirit. She challenges me in that way, a way that I've never really been challenged before. I'm thankful for Mary who leads our small group with such grace. I love how she listens and counsels and loves. I'm thankful for Jessica. Jessica is certainly the most appreciative leader I've ever worked under. She encourages me and prays for me. She rejoices when I rejoice, and she mourns when I mourn. She cares! I am honored to serve under her beautiful example of servant leadership. I'm thankful for Emily, a newfound friend who has a heart for her children like I have for mine. Her passion for home education is similar to mine, and I hadn't found that in anyone yet. I look forward to getting to know her better and finding what else we have in common. In this season, I'm thankful that God gives. For a long time I was seeing how He takes away, and it was necessary. And when He gives back, wow, is it awesome! I'm seeing His hand at work in ways I haven't noticed before. And I'm watching him place friends in my life to fill the void I had but also to challenge me in my walk with Him. The great gift He has given me this year is the gift of friendship. Godly friends who love Him and me. So blessed...so thankful! There's something about an online presence that makes one look stellar! Of course it makes one look that way because the things that are shared are the ones that glorify the person, that make her look fabulous! Most of us don't share our biggest mess-ups. Until now. I hear from a lot of friends (both face-to-face friends and online friends) that I'm so amazing and they just don't know how I do it all. Ha! If only you could see me daily! I had carefully laid out what Isaac could work on while I was doing the interviews. Aaron and Abigail had a plan, too. Everything went swimmingly well! Until I finished and called Isaac in to check his work. Y'all, it was bad! Not his work...my response. Mind you, he hadn't done the right thing, hadn't followed directions; he definitely needed a talking to. But I lost it. A big, ugly, yelling lost it. I'm thankful I didn't say anything awful, but it was still bad! Isaac left the room crying, and I sat there thinking why in the world had I responded that way. I waited a few minutes. I went to Isaac and tearfully apologized. We both cried and named precisely what we were sorry for. I then took the time to build him up. And then I prayed and asked God to forgive me and to help me respond much better the next time. I asked Him to work on my heart issue, the part that was far deeper than what manifested itself with Isaac. This parenting business is messy! And when I don't guard myself, it gets ugly. I am so far from perfect...so far from having it all together. But even when I lose it, I can find a way to make it a teachable moment for all of us. I had an opportunity to tell my son that this is a sin issue that I need to deal with; I have to allow God to transform me. I don't like for my kids to see me mess up, but those opportunities do allow me to show them that we all are in need of a Savior, that not one of us is perfect, that we can go to God for forgiveness and change, and that we can allow Him to continue to work in and through us. 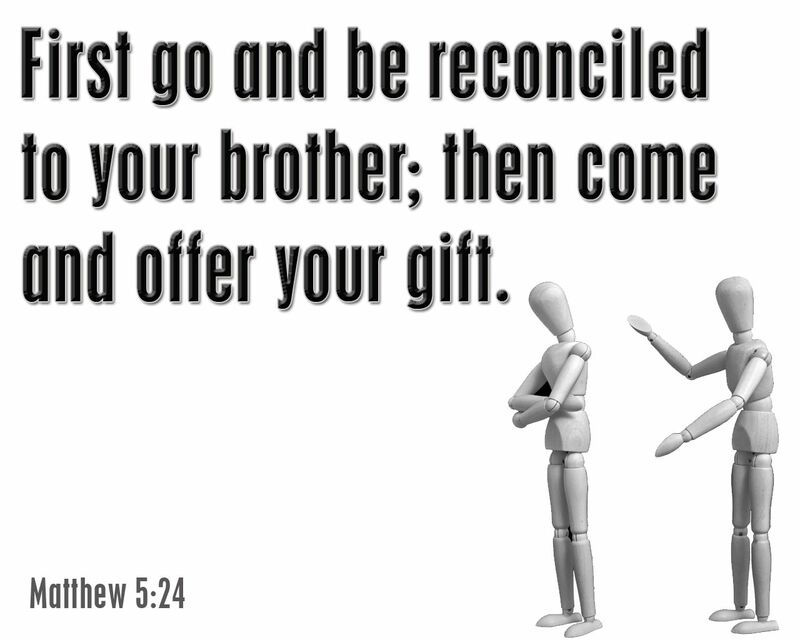 Today I got to take an ugly, ugly moment and live out Matthew 5:24 in front of my kids. I went to them to ask forgiveness and then asked God's forgiveness. They got to see Ephesians 4:27, 29 in action when I talked to them about how we have to recognize sin and not allow Satan a resting place in our hearts and how we have to use our words to speak life into one another. 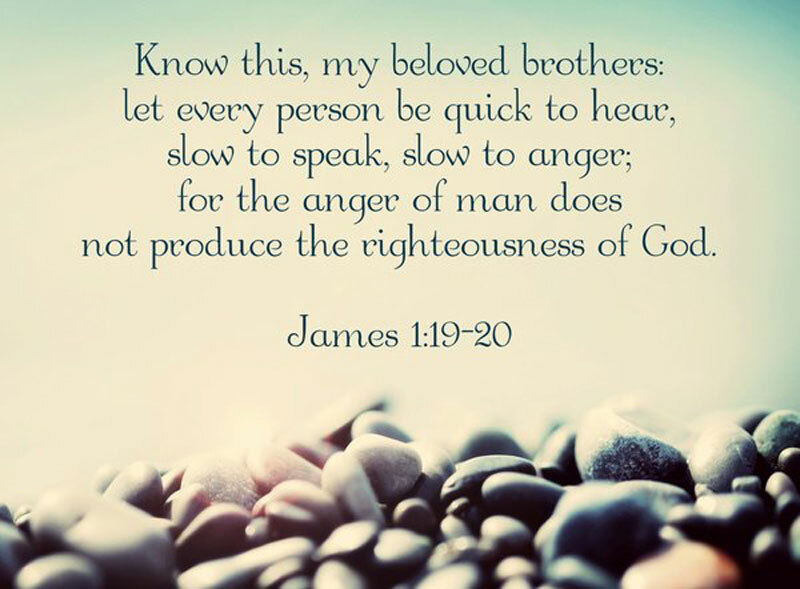 They also got to see me identify an area that needs work, as it says in James 1:19-20; I must be quick to listen and slow to speak; my anger does not bring about the righteous life God desires. Today was messy. It had an ugly moment. God still used it to cultivate His character in all of us. I remember the church service. It was a Sunday morning at the beginning of summer, and we sat in a church where we still knew hardly anyone. No one had reached out to us. No one had befriended us. And we were new! Here I was, a mom of three young kids, in a new city with no friends and no family. And I would say my attitude was pretty rotten. I hadn’t renewed my contract at the school, so I was looking ahead past the summer before me. Looking toward the coming fall where not only would I be friendless but also jobless. Then the worship team led us in the Chris Tomlin/Matt Redman worship song “Lay Me Down.” We got to the bridge…”It will be my joy to say Your will, Your way,” over and over again. And that’s when it hit me. Yes, I was walking in obedience. Yes, I had given up my dream job and was being a full-time mom to my kids. Yes, I was becoming a better wife. But it wasn’t with joy. So that’s when I chose that it would be my joy to walk in the will of God. Is every day easy? No! Are most days? No! Are some days? Yes! But regardless of what the days bring, I have determined that it will be my JOY to walk in God’s will! That does not mean I am always smiling and full of pep! Sometimes it is found in what I do not do. As much as I miss my job, I do not turn my thoughts to how much easier/better/more fun my life would be if I were working. I do not throw in the towel and search for a new job. I do not lock myself in my room, curl into a ball, and sob (at least not usually). Instead I relish in the moments where my kids make the right choices. I think about the times I am able to help shape their characters as we deal with discipline issues. I think about the times they laugh and have fun together. I think about the moments a lesson I am teaching them clicks. My joy is completely wrapped up in God’s calling in my life. I choose to be joyful following His lead rather than my own. I choose to accept where I am rather than compare it to where I used to be or where I sometimes want to be. My kids and my husband need me. That is the call God has placed on my life right now. And I embrace it! I encourage you to embrace the calling God has on your life as well! You’re not in it alone! Oh, there are days! There are days I am stressed. There are days I am frustrated. There are days I am annoyed. And there are days I need a time out. Sometimes the kids don't sleep well; sometimes I don't sleep well. Most of the time the youngest two feel the need to be right on top of me or right underneath me or right where they can inhibit my movement the most. The kids fight. I get tired. The day is long. Daddy is out of town for work. I clean the house only for a mess to be made immediately...without fail. We tidy up after lunch just in time to hear, "Can I have some cheese...some fruit snacks...some____?" (But seriously, do kids EVER stop eating?!?) It's never-ending, this mommy thing. And sometimes when my husband gets home from work, he needs me. But the kids still need me, too. And all day I feel like I just give, give, GIVE, until there is nothing...nothing! And in my exhaustion I beat myself up over all that I've done wrong during the day, and, believe me, there is always plenty! And I relegate myself to this life of sacrifice, where this is all I have to give, some tired, sometimes moody, frustrated woman. Ah, but no! I was reminded this week in my Proverbs 31 Ministries OBS that this is not all I have to give. I must return to the fountain of Christ, the living water, to be refreshed and replenished so that what I have to give is daily (sometimes multiple times a day) filled to overflowing, and I can offer myself, sacrifice myself and my desires, to the needs of those around me. Then I can be in a place to notice the people in my home that God has gifted me with as well as those outside my home who need to see Christ in me. This is all I have to give. A heart full of Christ and brimming with desire to shower His love on those around me. This week I started a book study with Proverbs 31 Ministries, and our work this week included writing on this very topic: Being a Mom is Tough! Seriously, there are days when I think I am a rock star status mom, and then there are those other days. The days when I am worn out and, as much as I love them, I need a little break from my kids. Having recently moved and not having made many friends yet, I just don&apos;t get the chance to get out of the house without the kids very often. This morning I was feeling that need for a break, for a little extra air between me and them. They were fighting with each other, and I just couldn&apos;t take it. So we had a family time-out! That&apos;s right! I put the boys each their bedrooms, I went in mine, and the baby was just outside my door so I could hear her. Everyone had toys or books, abd we all took some time for ourselves. And ten minutes later, guess what? We were able to enjoy one another again! Yep, this mom stuff is tough business. It&apos;s frustrating, infuriating, and often causes you to want to pull your hair out! But it&apos;s also endearing, rewarding, and so very teaching! So in those moments that you just can&apos;t take it...give the whole family a time-out and see if it helps you come back together better. Shhh...it's a secret! My confession? I never wanted to be a stay-at-home mom. Sure, I would throw the "I wish" phrase around every now and then. It was easy to do that from my comfy job. I am a high school English teacher; rather, I was. I LOVE teaching high school students, and they love me...mostly because they know how much I care about them. I LOVED my job. And I LOVED my kids. And I was always a bit torn between those two things...sure, I thought it might be nice to be home with my kids, but I truly felt that my teaching job was my calling. I have been hand-crafted by God to teach high school students. And I never had plans to quit doing that. Then my husband got a job promotion, and we decided to move an hour away for him to take it. I loved my job so much that I traveled back and forth about two and a half hours each day (through the snow and ice on several occasions) for five months. It became clear a couple months in that the driving was too stressful on my kids, indeed on my entire family. So I didn't renew my contract for this upcoming school year. (Side note: I am still working one day a week...more on that to come later.) And I found myself in the stay-at-home-mom category. Let me be quite clear: I am amazed at stay-at-home moms because they never get a break from the kids...because the bulk of the cleaning and cooking rests on their shoulders...because they have to be creative, organized, and at times spontaneous. And as my adventure in this job has begun, I am also amazed at how many times a day they are offered, I am offered, a chance to grow in godliness. See, my being a stay-at-home mom was not my plan or my desire, but as I've begun to walk in it, God has given me an excitement and passion for it that I just never saw coming. So I never wanted to be a stay-at-home mom, but the joy I have found in doing just what I've never wanted to do is a testimony of God's work in my heart. And this is at the forefront of my unbecoming. Unbecoming what I had planned and walking in His plan. Unbecoming...get this...something I'm good at and that God skilled me for in order to become the mother that He desires for my children and the wife He desires for my husband. Unbecoming a position by worldly standards for an often thankless and overlooked one...that of a stay-at-home mom. Unbecoming. So that He can make me lovely. Unbecoming is often an adjective, but here I am using it as an action verb. Unbecoming what, you ask? Lots of things! But I can neatly summarize it by saying that I am allowing Christ to author my entire life. I truly thought I had been doing this, but as I've stepped back over the past few weeks and months from a lot of things I was, I am realizing that despite my very best efforts, I in many ways had allowed my life to be shaped by the world. So I purposed in my heart to "unbecome." The purpose of this blog is to document that process, although you'll certainly get recipes, fun family activities, and other treats along the way. Take this journey with me; allow Christ to transform you as you unbecome, And what emerges as we allow Him to strip us of the world is truly lovely. All of our processes will not look the same, so no comparisons allowed! Just be guided by His hand that is perfectly able to conform us to His image. I am a wife, a mom of three, and, most importantly, a daughter of God. I am on my journey of unbecoming...follow me!